Michael's bloggy blog! 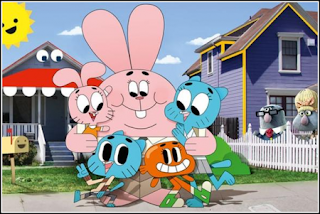 : The Amazing World of Gumball! This is a picture of the show I'm animating on at the moment. Boulder Media are making it for Cartoon Network and I'm doing 3d animation, such as the 2 characters looking at them over the fence. It's a great show and very funny so I'm dying for it to air on TV... but that's a long way away!